Historically speaking, the Kingdom of Bahrain was one of the earliest countries in the GCC to discover its oil reserves. However, it was also one of the region’s earliest countries to develop its non-petroleum economic sectors since the late 20th century; this was mainly attributed to Bahrain’s limited oil reserves. As a result of that, the tourism and financial services sectors in Bahrain has boomed over the last two decades; the island kingdom has turned into a financial hub for the region, with Seef being one of its major commercial areas. Over time, Seef district, along with Amwaj Islands, has grown to be the most expensive property rental market in Bahrain. In this article, we discuss the reasons and specifications that made Seef area one of Bahrain’s most active property markets; we will then demonstrate the average property prices and rental rates there. Situated in the northern part of Manama, the capital city of Bahrain, Seef was developed as a result of land reclamation works; this suburban area is surrounded by the waters from three sides. As a matter of fact, the area’s name actually means “shore” in the region’s dialect. This has naturally led Seef neighborhood to be one of the city’s most sought-after luxurious areas. Another advantage which the district enjoys because of its location is its proximity to the other vital areas of Manama. This includes the man-made Reef Island, the Diplomatic Area, which can be easily reached through Shaikh Khalifa bin Salman Highway that borders Seef from the south. Not only does Seef area offer a waterfront spot to live and work in, it is also one of the freehold areas of the Kingdom of Bahrain. By definition, this means that non-Bahraini citizens can buy and own properties in Seef. Such an option has only added to the area’s potential as an investment attraction. 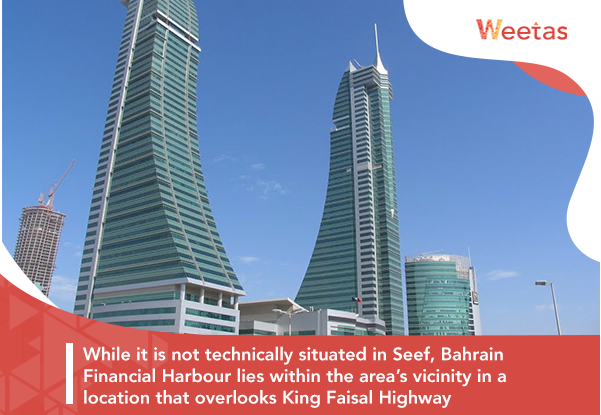 Seef enjoys a strategic location that overlooks a vital part of the northern coastline of Bahrain’s main island. Because of this, many multinational firms – specially financial services providers and investment banks – have chosen it to house their headquarters or regional office. Some of the renowned companies situated in Seef are Bahrain Kuwait Insurance, Ahli United Bank Headquarters, and Zain Bahrain. It is no secret that one of the crucial factors of determining the value of any property, and area in general, is the facilities it houses or at least provides easy access to as well as the strength of its infrastructure networks. While there are no primary or high educational facilities in Seef, there are multiple schools located in its vicinity and surrounding areas. This includes Naim Secondary Boys School, Ibn Elhaytham Islamic School, and Bahrain Special Education Institute. On the other hand, due to its nature as a commercial hub, Seef houses several professional training centers like Victory Training & Development Institute, Genetech Training and Development, Tylos Human Development and Al Mashreq Training. 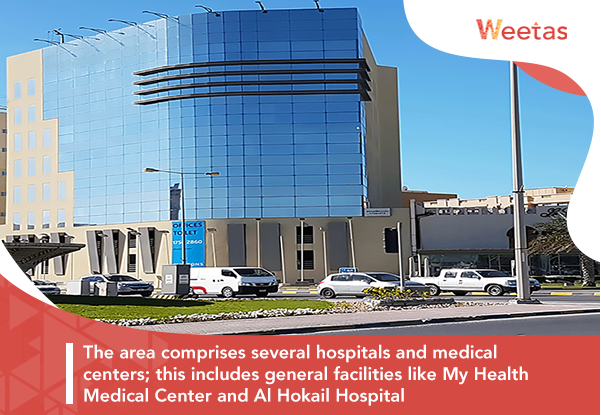 The area comprises several hospitals and medical centers; this includes general facilities like My Health Medical Center and Al Hokail Hospital, as well as specialized clinics like and centers like Nova Dental Center and The Eye Infirmary. 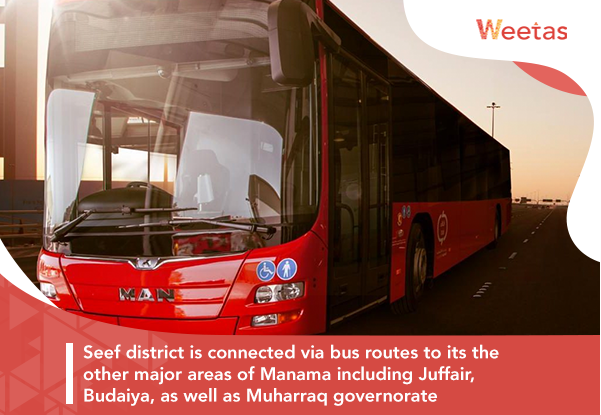 Seef district is connected via bus routes to its the other major areas of Manama including Juffair, Budaiya, as well as Muharraq governorate; there is also another bus route connecting Bahrain International Airport and the campus of the University of Bahrain in Sakheer which passes through Seef. 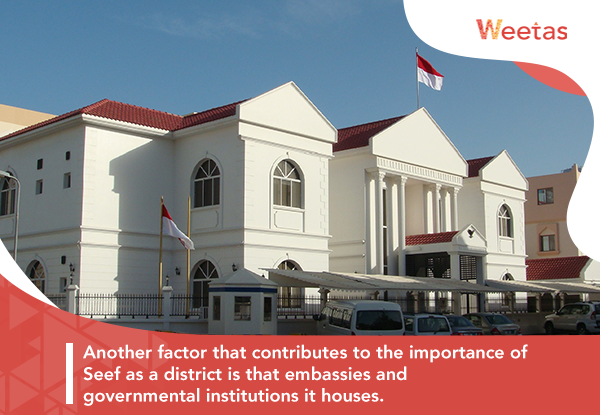 Another factor that contributes to the importance of Seef as a district is that embassies and governmental institutions it houses. The embassies of India (Indians count for the largest expat community in Bahrain), Malaysia, and Iran in Bahrain are located in Seef. On the other hand, Seef comprises governmental authorities like National Health Regulatory Authority and Ministry of Youth and Sport Affairs. Seef area encompasses tourism attractions that range from ancient and historical sites to modern entertainment complexes. The most famous of these attractions is probably Bahrain Fort, the 16th century fortress which was once the heart of the Dilmun empire, and its museum. In addition to that, the district features Wahooo! Water Park, which is considered one of the must-visit attractions in Bahrain. A major reason that has led to the active status of Seef’s property market is the area’s shopping attractions. City Centre Bahrain, Bahrain’s largest mall which encompasses the aforementioned Wahoo! Water Park, is located in Seef. Not only does City Centre Bahrain comprises outlets for international lifestyle brands, restaurants, and cafes, it also hosts many major events and exhibitions; for example, the complex has hosted the latest edition of Bahrain Property Brokerage Expo which was held last February. In addition to City Centre Bahrain, the district also includes Seef Mall, Bahrain’s second largest mall located on Shaikh Khalifa bin Salman Highway. 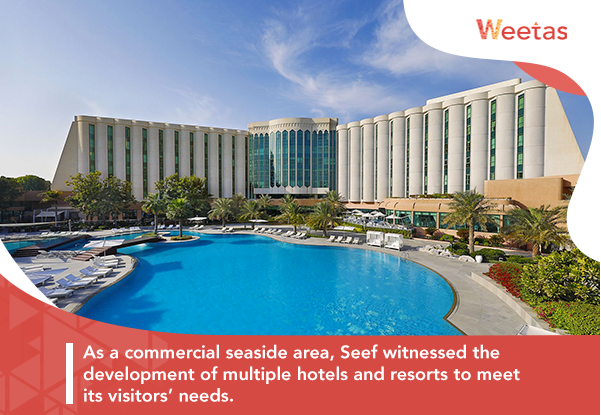 As a commercial seaside area, Seef witnessed the development of multiple hotels and resorts to meet its visitors’ needs. The district’s most famous hospitality attraction is the Ritz Carliton Bahrain, which has its own private lagoon and island. Additionally, the area is home for Jumeirah Royal Saray Bahrain resort, as well as other landlocked hotels like Fraser Suites Seef Bahrain, which grants its guests quick access to Seef Mall, and the four-star Swiss-bel Hotel Seef. 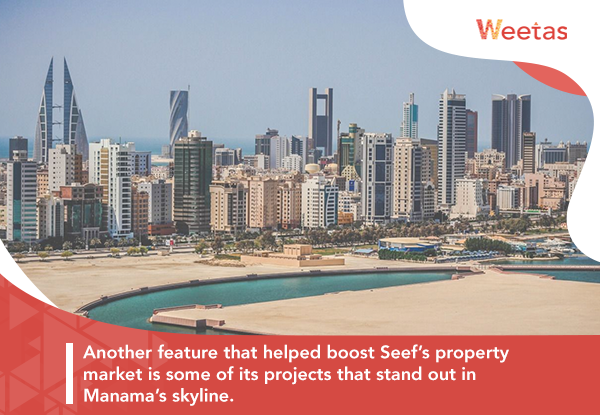 Another feature that helped boost Seef’s property market is some of its projects that stand out in Manama’s skyline. 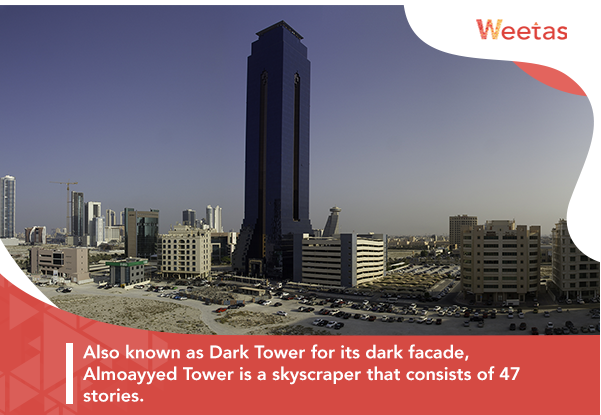 Also known as Dark Tower for its dark facade, Almoayyed Tower is a skyscraper that consists of 47 stories. Until 2008, Almoayyed was the highest building in the entire Kingdom of Bahrain, with the height of 172 meters, before being topped by the World Trade Center in 2008. The tower comprises office and commercial spaces and is built over an area that spans 48,400 square meters of space; in addition to the commercial units, Almoayyed also includes a car park that can accommodate up to 1,000 cars. A major residential project comprising three towers, Abraj Al Lulu (Pearl Towers in English) was also ranked as the tallest tower in Bahrain upon its completion in 2009. The project is located on King Faisal Highway within the proximity of the landmarks of Seef and the surrounding areas. Two of the three towers comprise 50 stories each while the third one comprises 40 stories. Together, the three towers include more than 850 apartments with variant specifications. Abraj Al Lulu provides its residents with access to multiple fancy features that include a four-storey car park that can house up to 1,100 vehicles. While it is not technically situated in Seef, Bahrain Financial Harbour lies within the area’s vicinity in a location that overlooks King Faisal Highway between Seef district and the Diplomatic Area. A twin-tower commercial project that comprises 53 floors with the height of 260 meters, Bahrain Financial Harbour is currently the highest building in the island kingdom. It is one of the most sought-after spots for people who would like to start their own business in Bahrain. (Note: for more on this topic, you can read the following insights to know more about the best small business ideas in Bahrain and the procedures of starting a business in Bahrain. You can also read our analysis of the World Bank report on Doing Business in Bahrain in 2019). 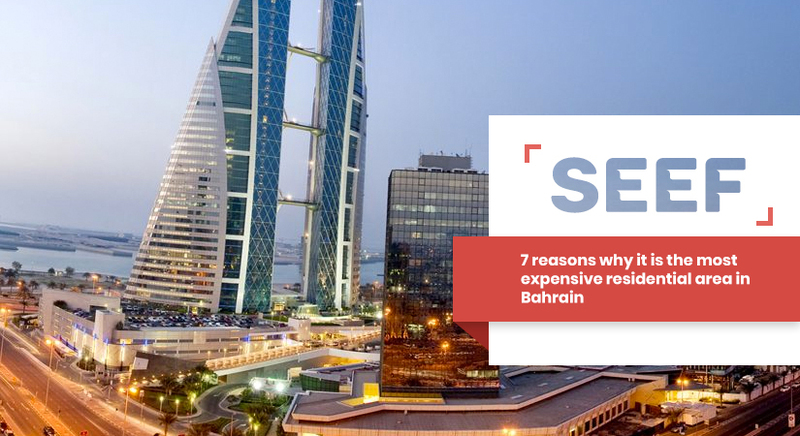 As a result of all the listed reasons and specifications, Seef has naturally grown to be the most expensive area to live in in Bahrain along with Amwaj Islands. And despite its high average prices, Seef is a preferred destination for buying properties in Bahrain. If you are seeking a home to buy in this upscale area for yourself, you can own fully furnished one-bedroom apartment in Seef for prices that range between 65,000BD and 70,000BD on average. On the other hand, if you would like to move out with your small family, then a two-bedroom apartment in Seef located in an upscale tower with several amenities and facilities (swimming pool, fitness gym, steam baths, and others) would cost you around 90,000BD. If you are an expat whose employer is situated in Seef, the rent option might suit you more. In which case, you can rent an adequately furnished one-bedroom flat in Seef for rent that range between 500BD and 600BD on average. As for larger spaces, the rentals of two-bedroom apartments in Seef start from around 600BD per month and go up according to the property’s specifications (location, accessible amenities, etc). All in all, whether what you’re looking for is a lucrative investment location, a new luxurious area to live in, or a place to start your business in Bahrain, Seef is definitely one of the spots you should consider.